A man in a prison uniform stood on a podium Sunday morning at Nelson Memorial United Methodist Church and spoke to a group of church members and nine inmates from the Boonville Correctional Center. "For the first time in a long time, I felt love," Nino Esparza said of the week he spent in the Prison Fellowship program. "Please, please, don’t give up on us. We need you." He stepped down from the platform to a standing ovation, hugs and pats on the back. Soon after his speech, Esparza and the other inmates came forward to receive certificates for completing volunteer work for Boonville through the annual program sponsored by the Prison Fellowship with assistance from the church. They knelt down to pray with church members who put their hands around inmates’ shoulders and heads. The 10 inmates, all of whom are in work release programs at the prison, were chosen from among 20 applicants for the 23rd annual Boonslick Area Community Service Project. Those selected for the program are usually nearing their release dates and attend church in prison. They spent last week painting and refurbishing the town's Katy Caboose, a historic symbol of the Missouri-Kansas-Texas railroad line that used to stop at the Katy Station. They also had devotion times and enjoyed home-cooked meals. The program is designed not only to serve the community but also to give the inmates courage to reintegrate into their communities. "As we were painting that old train and seeing it come to life, I looked around me and you know what I saw?" Esparza said. "Men, also coming back to life again." During post-meal devotions, Firm Foundation Foursquare Church pastor Mel Eaton encouraged the inmates to focus on God’s purpose rather than the circumstances that brought them problems. Last Tuesday, he told the Bible story of Jesus walking on water as he approached the apostle Peter, who was "scared to death" on a boat during a fierce storm. In the story, Jesus tells Peter to come to him, and soon Peter realizes he is walking on water, too. "Nothing about the situation has changed yet," Eaton said of Peter as he preached to the inmates in the Foursquare Church kitchen. "His focus changed." The occasional "amen" and "uh-hmm" came from the inmates. Curtis Henderson was there nodding his head. "Most of my life, I lived my life thinking about me," said Henderson, who has two years left on a 10-year prison sentence. "I’m trying to change my life. … I want to give back to a community." Although Henderson liked the food and devotions last week, he said he enjoyed working the most. "It makes me forget where I am." In March, Henderson's passion for work led him to pass the HiSET Exam — a reading, writing, math, science, and social studies test for adults to secure a high school diploma. He said he would spend half his prison day in school and the other half working. He even checked out maps and science books to study after work. "(I knew that) I had to keep doing it over and over and over," Henderson said with a smile. "And I finally got it." Repeating the daily routine for four years wasn’t easy. Henderson dropped out of high school at 16 with a learning disability. He didn’t know multiplication or how to calculate percentages. His mother was an alcoholic and his dad a workaholic, he said. No one was at home to care for him and his sister. He ended up staying on the streets until late then sleeping in class. Still, Henderson doesn’t blame his parents. "There was a certain time in my life when I knew when I needed to take charge and do the right thing. And I didn’t do that." He became addicted to alcohol and drugs. In 2009, he was driving with a revoked license after doing methamphetamine. He hit a motorcycle at a stop sign and its driver died. The episode nearly caused Henderson to kill himself. He said he has learned during his time in prison how to overcome his problems. "One of the things that I found, that I wish had known a long time ago, (is that) the harder you work, the less time you get to be in trouble," he said. The Prison Fellowship is a Christian organization that supports the restoration of those affected by incarceration, including prisoners, victims and their families. The church's ministry team chairman, Tom Maxwell, extended the national prison outreach project to Missouri in 1994 and has run it since then. Maxwell said he wasn't interested in prison ministry when his friend and Prison Fellowship founder Charles Colson first suggested it. "I really felt the inmates were there because they deserved to be there," he said. Maxwell changed his mind after his first visit to a prison in Washington, D.C. When he returned home, his wife looked into his eyes. "We have a ministry, don’t we?" she said. "Yes we do," Maxwell replied. 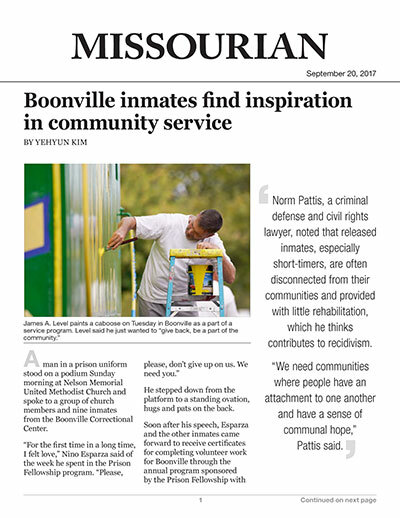 Maxwell thinks the Boonville program is valuable to the inmates, to the churches involved and to the community. "Everybody sees the bad stuff on TV and doesn’t see the goodness in these men," Maxwell said. "This is a week that they can see, and some citizens will come by and stop to talk to the men and say: 'Thank you for what you are doing for us.'" Cindy Koch, who has made breakfast for inmates in the program for several years, said the Sunday church service with the prisoners affects her the most. Hearing inmates’ personal stories makes her feel like she's really touched them. Koch shed tears after Esparza's speech. "He was talking about walls and how sometimes we build up walls, too, that keep (us) away from them," she said. "But I realized that they were people just like us who need love and need help." Inmate James Level stood in front of the church members with his certificate and wiped his eyes. During a Sunday school session, he shared his life story, which included incidents of drunk driving and attempted suicide. The chance to do that touched his heart, he said. "This stay in prison has turned my whole life around," Level said. He earned his high school diploma this year at 52, and he quit smoking. He plans to go to college, and he said he has received a two-year scholarship. "My life has just begun!" he said. Henderson said his goal is also to start a new life, but it's a scary challenge. "My goal is not to go around anybody that I used to hang around with," he said, adding that he has already told old friends that he still loves them but he will never see them again. Henderson said not everyone in prison is like him or the other inmates in the fellowship program. "In there, there is a lot of negativity. You are around the same people every day. They are doing the same thing," he said. "Some people want to change; some people don’t want to change." Level said he feels bad for the prisoners who don't get to participate in the program. He doesn't plan to talk to them about his experience for fear of making them jealous. "There is so much pain, and there is a lot of anger in the prison," Level said. Racior Towns, who graduated from the fellowship program in 1998 and 2000, said not returning to his past routine of alcohol and drug abuse was the most difficult part of reintegrating when he was released 17 years ago after 2 1/2 years in prison. "I had to make new friends. I had to learn how to go to new places. Had to learn how to do new things," Towns said. Going to church, reading the Bible and meeting support groups helped him stay sober. He continues to work as a truck driver. The fellowship project gave him hope. "There wasn’t a moment that I wasn’t around those folks that I didn’t feel welcomed," he said. "From the very moment that I met them up to the time that I left, they were right there." A Bureau of Justice Statistics survey found that 76.6 percent of prisoners are rearrested within five years. Norm Pattis, a criminal defense and civil rights lawyer, noted that released inmates, especially short-timers, are often disconnected from their communities and provided with little rehabilitation, which he thinks contributes to recidivism. "We need communities where people have an attachment to one another and have a sense of communal hope," Pattis said. Inmates who participated in an in-prison program that teaches life skills and values and who received guidance from a mentor and support from a local faith community for 12 months after their release were 50 percent less likely to be rearrested, according to a study by the University of Pennsylvania's Center for Research on Religion and Urban Civil Society. When Henderson is released in two years, he will meet a daughter and son that he hasn’t seen for 16 years. He'll also meet his grandchildren for the first time. He's managed to save a couple thousand dollars while working for about $1 per hour at the prison. He hopes to get his driver's license back. That, he said, should help prevent him from returning to his past life. "I'm trying to do my best, because I don't ever wanna go back," he said. "Horrible experience. I'm done."